Sandra Day O'Connor has 2 media appearances. Sandra Day O'Connor discusses Lazy B: Growing up on a Cattle Ranch in the American Southwest. 7PM WEDNESDAY, MARCH 19 H. Alan Day: The Horse Lover H. Alan Day, brother of former Supreme Court Justice Sandra Day O'Connor and co-author of her bestselling memoir Lazy B, presents his new book The Horse Lover: A Cowboy's Quest to Save the Wild Mustangs. Day already owned and managed two ranches — he needed a third about as much as he needed a permanent migraine. Or at least that's what he said every time a friend pestered him about an old ranch in South Dakota. But in spite of himself, he soon became the proud owner of 35,000 pristine grassy acres. The opportunity then dropped into his lap to establish a sanctuary for unadoptable wild horses previously warehoused by the Bureau of Land Management. After Day successfully lobbied Congress, those South Dakota acres became Mustang Meadows Ranch, the first government-sponsored wild horse sanctuary established in the United States. The Horse Lover is Day's personal history of the sanctuary's surprises and pleasures — and its plentiful dangers, frustrations, and heartbreak. He weaves together recollections of training fifteen hundred wild horses, his cowboying adventures astride some of the best, and the lessons they all taught him about loyalty, perseverance, and hope. "It is impossible to see a herd of wild horses running free without feeling a surge of excitement and enthusiasm for their vigor, power, and beauty. To watch them run with their manes and tails flying in the wind is to experience a sense of the ultimate freedom of motion." —From the foreword by Sandra Day O'Connor, former U.S. Supreme Court justice ABOUT THE AUTHOR H. Alan Day was the owner of Mustang Meadows Ranch near St. Francis, South Dakota; Rex Ranch near Whitman, Nebraska; and Lazy B Ranch in southern Arizona. With his sister, Sandra Day O'Connor, he coauthored Lazy B: Growing Up on a Cattle Ranch in the American Southwest. Sandra Day O'Connor is currently considered a "single author." If one or more works are by a distinct, homonymous authors, go ahead and split the author. 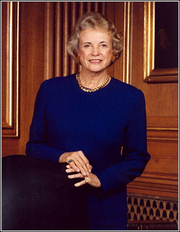 Sandra Day O'Connor is composed of 4 names. You can examine and separate out names.